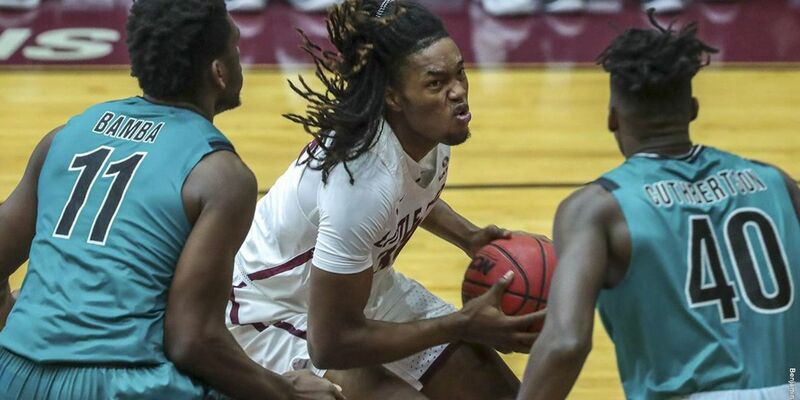 LITTLE ROCK, Ark – Zac Cuthbertson’s free throw with 1.3 seconds left in the game, gave CCU a 72-71 road win at Little Rock. The Chants held a 66-51 lead with less than eight minutes left in the game only to see the home-standing Trojans come all the way back and even the score at 71 on a three-point basket from Rayjon Tucker with less than a minute left. After a Coastal turnover and a turnover from Little Rock with seven seconds left, the Chants got the ball to Cuthbertson who was fouled on a three-point attempt. After hitting the first free throw, Cuthbertson missed the second and then missed the third on purpose giving the Trojans one last shot from beyond half court that missed its mark. DeVante’ Jones, playing only his third game back from injury, finished the game with a team and career-high 21 points. Ajay Sanders also had a career-setting night finishing with 19 points. Tyrell Gumbs-Frater finished the game with 11 points giving the Chants three double-digit scorers. CCU was losing the rebounding battle at halftime, but came back in the second half and finished with 38 rebounds compared to 31 for Little Rock. Cuthbertson had a game-high 10, with Tommy Burton grabbing six and Sanders five. Tucker was on target all night for the Trojans and finished with a game-high 29 points. He hit six field goals, three of which were beyond the three-point line, and was an impressive 14-15 at the free throw line. The Trojans had a big game from its bench as Deondre Burns (11 pts), Kris Bankston (10 pts) and Markquis Nowell (10 pts) all came off the bench to reach double digits for LR. The Trojans finished the game shooting 46 percent from the field, but only 28 percent (5-18) on its three-point attempts. They hit 16-of-21 free throws for 76 percent. Bankston and Kamani Johnson led Little Rock’s rebounding efforts with seven each. Little Rock carried a 34-32 lead into the locker room at halftime as Tucker scored 14 first-half points to lead the Trojans. LR shot 50 percent from the field and hit eight of its 11 free throws. LR also grabbed 18 rebounds. The Chants only shot 36 percent in the opening half with Jones and Snaders leading the way with nine points each. The Chants will continue the present road trip through Arkansas when they face Arkansas State Saturday Jan. 26 in Jonesboro. Opening tip is set for 5 p.m. (ET).